In order to "provide society with products and services to realize a comfortable everyday life, through 'energy conservation,' 'environmental mitigation' and 'improved security,'" we, the LECIP group, recognize that our most important challenges in management are the realization of management which values the interests of our customers, our shareholders and all our other stakeholders, and the enhancement of corporate governance, and we are implementing initiatives based on the following five basic policies. Furthermore, we have adopted a holding company system, and are striving to further enhance the governance of the entire group, by providing each operating company with management guidance which is in line with management, supervision and group business strategies. Through the development of an appropriate environment pertaining to the exercise of rights at shareholders meetings, etc., we guarantee the substantial rights of shareholders, and guarantee the substantial equality of all shareholders. We foster a corporate culture and climate in which stakeholders are valued, and, through appropriate collaboration with stakeholders, including customers, shareholders, employees, business partners, and local communities, we achieve sustainable growth of the company and the creation of mid- and long-term corporate value. We construct a foundation which supports constructive communication with shareholders, etc., by actively tackling issues of appropriate disclosure and provision with regard not only to financial information, but also to other highly useful corporate information, such as management policies, management challenges, the status of business activities, and CSR activities. The Board of Directors promotes the company's business strategy, in which management resources are focused into the three fields of "Lighting," "Electric Power Conversion" and "Information Processing," to create products which will hold the top share in each business field. For the achievement of the strategy, the Board of Directors: appropriately fulfills its roles and responsibilities, such as developing an environment which supports appropriate risk taking by management staff and conducting highly effective supervision over management and the directors; promotes sustainable growth of the company and the improvement of mid- and long-term corporate value; and works to improve profitability and capital efficiency. By promoting constructive communication between us and our shareholders through IR activities such as briefings for investors, the issuing of annual reports, shareholder newsletters, etc., and the dissemination of information through the mass media, etc., we strive to gain the understanding of shareholders with regard to our business strategies, management plans, etc., and we work to achieve sustainable growth of the company and the improvement of mid- and long-term corporate value. 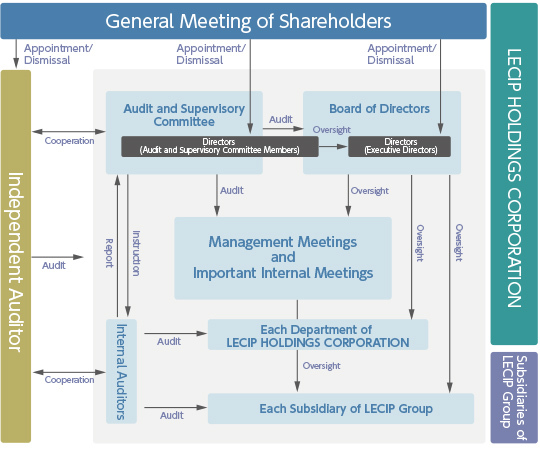 LECIP Holdings is a company with an audit and supervisory committee, and is aiming to further enhance the supervisory function of the Board of Directors and corporate governance. We have appointed highly independent outside directors to the audit and supervisory committee, and receive from them advice from a neutral position which is beneficial to the management of the company. Also, we have stipulated in the articles of incorporation that the company can entrust to management, for example its managing director, decision making with regard to the execution of important business matters, and we are promoting the creation of a system which enables quick decision making and the flexible execution of business. In October 2007, LECIP HD drafted a Compliance Code and prescribed a Code of Conduct to ensure legal compliance. LECIP has established a Corporate Governance Committee responsible for overall risk management. Chaired by LECIP HD's President, the Committee is engaged in compliance management to promote widespread awareness of the Code of Conduct and initiatives related to legal compliance. To further promote legal compliance, the Committee also conducts activities to ensure that individual organizational units' personnel are universally aware of the provisions of the Compliance Code and applicable laws and regulations with which they should comply. LECIP HD has established a number of committees to promote activities aimed at preventing various (e.g.,product, environmental, safety) risks from manifesting and minimizing losses when risks do manifest. LECIP HD is endeavoring to strengthen its group-wide risk management regime through such means as empowering individual organizational units to formulate preventive measures and manage risks from the standpoint of their specialized expertise. As a precaution against the unlikely event of risks actually manifesting despite such preventive measures, and to respond to risk warning signs, LECIP HD has formulated a risk information reporting manual and established procedures for expeditiously sharing information through the Corporate Governance Committee. In such instances, LECIP HD will endeavor to rapidly resolve the problem, minimize adverse repercussions, identify the underlying cause, and devise and implement recurrence prevention measures through such means as establishing a special task force. To ensure that business operations are executed appropriately in accordance with the Companies Act, LECIP will prescribe Basic Policies for Implementation of Internal Control Systems and establish and augment internal control systems throughout the LECIP Group. The LECIP Group recognizes information security as a significant management issue and is endeavoring to establish an advanced information security management system (ISMS) throughout the Group. In this context, part of LECIP CORPORATION's business operations and LECIP ENGINEERING CORPORATION have received the ISO 27001 certification, the international standard for information security management systems. We will periodically review the action plan and procedures to ensure that business activities can be resumed within a targeted recovery time and the certainty of business continuity can be enhanced in case of an unpredictable phenomenon such as a natural disaster or an accident.